Damaging Storms are a Reality. Storm damage can create stress with both the inconvenience of extreme home repairs and having to deal with your insurance company to cover the cost. 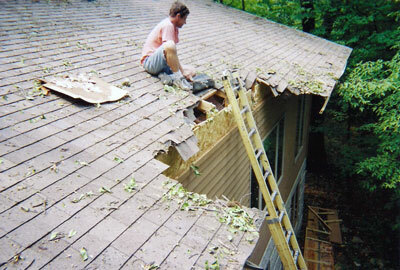 When your roof is damaged, there is a good chance that your homeowner's insurance will cover the repair expense. Wm Hayes Construction will meet with the adjuster to review the estimate and scope of work. I hired Wm Hayes Construction in 1985 to replace all the windows in my house. He did such a fine job that the following year I again hired him to redo the outside of the house. That job consisted of replaced the siding with steel siding, insulation, soffits, and fascia. Later on he replaced my small deck with a 12 x 18 deck. He told me that the base of the deck would support a room. We go to bat for you!.